This article is about the Irish Free State from 1922 to 1937. For the current Irish state, see Republic of Ireland. The Irish Free State (Irish: Saorstát Éireann pronounced [ˈsˠiːɾˠ.sˠt̪ˠaːt̪ˠ ˈeːɾʲən̪ˠ]; 6 December 1922 – 29 December 1937) was a state established in 1922 under the Anglo-Irish Treaty of December 1921. That treaty ended the three-year Irish War of Independence between the forces of the self-proclaimed Irish Republic, the Irish Republican Army (IRA), and British Crown forces. Location of the Irish Free State. Northern Ireland is in light green. The Free State was established as a Dominion of the British Commonwealth of Nations. It comprised 26 of the 32 counties of Ireland. Northern Ireland, which comprised the remaining six counties, exercised its right under the Treaty to opt out of the new state. The Free State government consisted of the Governor-General, the representative of the King, and the Executive Council (cabinet), which replaced both the revolutionary Dáil Government and the Provisional Government set up under the Treaty. W. T. Cosgrave, who had led both of these governments since August 1922, became the first President of the Executive Council (prime minister). The Oireachtas or legislature consisted of Dáil Éireann (the lower house) and Seanad Éireann, also known as the Senate. Members of the Dáil were required to take an Oath of Allegiance to the Constitution of the Free State and to declare fidelity to the king. The oath was a key issue for opponents of the Treaty, who refused to take the oath and therefore did not take their seats. Pro-Treaty members, who formed Cumann na nGaedheal in 1923, held an effective majority in the Dáil from 1922 to 1927, and thereafter ruled as a minority government until 1932. In 1931, with the passage of the Statute of Westminster, the Parliament of the United Kingdom relinquished its remaining authority to legislate for the Free State and the other dominions. This had the effect of making the dominions fully sovereign states. The Free State thus became the first internationally recognised independent Irish state. In the first months of the Free State, the Irish Civil War was waged between the newly established National Army and the anti-Treaty IRA, who refused to recognise the state. The Civil War ended in victory for the government forces, with the anti-Treaty forces dumping their arms in May 1923. The anti-Treaty political party, Sinn Féin, refused to take its seats in the Dáil, leaving the relatively small Labour Party as the only opposition party. In 1926, when Sinn Féin president Éamon de Valera failed to have this policy reversed, he resigned from Sinn Féin and founded Fianna Fáil. Fianna Fáil entered the Dáil following the 1927 general election, and entered government after the Irish general election, 1932, when it became the largest party. De Valera abolished the Oath of Allegiance and embarked on an economic war with the UK. In 1937 he drafted a new constitution, which was passed by a referendum in July of that year. The Free State came to an end with the coming into force of a new constitution on 29 December 1937 when the state took the name "Ireland". The Easter Rising of 1916 and its aftermath caused a profound shift in public opinion towards the republican cause in Ireland. In the December 1918 General Election, the republican Sinn Féin party won a large majority of the Irish seats in the British parliament: 73 of the 105 constituencies returned Sinn Féin members (25 uncontested). The elected Sinn Féin MPs, rather than take their seats at Westminster, set up their own assembly, known as Dáil Éireann (Assembly of Ireland). It affirmed the formation of an Irish Republic and passed a Declaration of Independence. The subsequent War of Independence, fought between the Irish Republican Army (IRA) and British security forces, continued until July 1921 when a truce came into force. By this time the Ulster Parliament had opened, established under the Government of Ireland Act 1920, presenting the republican movement with a fait accompli and guaranteeing the British presence in Ireland. In October negotiations opened in London between members of the British government and members of the Dáil, culminating in the signing of the Anglo-Irish Treaty on 6 December 1921. The Treaty allowed for the creation of an independent state to be known as the Irish Free State, with dominion status, within the then British Empire—a status equivalent to Canada. The Parliament of Northern Ireland could, by presenting an address to the king, opt not to be included in the Free State, in which case a Boundary Commission would be established to determine where the boundary between them should lie. Members of the parliament of the Free State would be required to take an oath of allegiance to the king, albeit a modification of the oath taken in other dominions. The Dáil ratified the Treaty on 7 January 1922, causing a split in the republican movement. A Provisional Government was formed, with Michael Collins as chairman. The Treaty, and the legislation introduced to give it legal effect, implied that Northern Ireland would be a part of the Free State on its creation, but in reality the terms of the Treaty applied only to the 26 counties, and the government of the Free State had neither de facto nor de jure power in Northern Ireland. The Treaty was given legal effect in the United Kingdom through the Irish Free State Constitution Act 1922. That act, which established the Free State, allowed Northern Ireland to "opt out" of it. Under Article 12 of the Treaty, Northern Ireland could exercise its option by presenting an address to the King requesting not to be part of the Irish Free State. Once the Irish Free State Constitution Act was passed on 5 December 1922, the Houses of Parliament of Northern Ireland had one month (dubbed the "Ulster month") to exercise this option during which month the Government of Ireland Act continued to apply in Northern Ireland. If the Parliament of Northern Ireland had not made such a declaration, under Article 14 of the Treaty Northern Ireland, its Parliament and government would have continued in being but the Oireachtas would have had jurisdiction to legislate for Northern Ireland in matters not delegated to Northern Ireland under the Government of Ireland Act. This, of course, never came to pass. A symbol most often associated with the new state's postal system. The Treaty established that the new Irish Free State would be a constitutional monarchy, with a Governor-General as representative of the Crown. The Constitution of the Irish Free State made more detailed provision for the state's system of government, with a three-tier parliament, called the Oireachtas, made up of the King and two houses, Dáil Éireann and Seanad Éireann (the Irish Senate). Executive authority was vested in the King, with the Governor-General as his representative. He appointed a cabinet called the Executive Council to "aid and advise" him. The Executive Council was presided over by a prime minister called the President of the Executive Council. In practice, most of the real power was exercised by the Executive Council, as the Governor-General was almost always bound to act on the advice of the Executive Council. The King in the Irish Free State was represented by a Governor-General of the Irish Free State. The office replaced the previous Lord Lieutenant, who had headed English and British administrations in Ireland since the Middle Ages. Governors-General were appointed by the King initially on the advice of the British Government, but with the consent of the Irish Government. From 1927 the Irish Government alone had the power to advise the King whom to appoint. As with all dominions, provision was made for an Oath of Allegiance. Within dominions, such oaths were taken by parliamentarians personally towards the monarch. The Irish Oath of Allegiance was fundamentally different. It had two elements; the first, an oath to the Free State, as by law established, the second part a promise of fidelity, to His Majesty, King George V, his heirs and successors. That second fidelity element, however, was qualified in two ways. It was to the King in Ireland, not specifically to the King of the United Kingdom. Secondly, it was to the King explicitly in his role as part of the Treaty settlement, not in terms of pre-1922 British rule. The Oath itself came from a combination of three sources, and was largely the work of Michael Collins in the Treaty negotiations. It came in part from a draft oath suggested prior to the negotiations by President de Valera. Other sections were taken by Collins directly from the Oath of the Irish Republican Brotherhood (IRB), of which he was the secret head. In its structure, it was also partially based on the form and structure used for 'Dominion status'. Although 'a new departure', and notably indirect in its reference to the monarchy, it was criticised by nationalists and republicans for making any reference to the Crown, the claim being that it was a direct oath to the Crown, a fact demonstrably incorrect by an examination of its wording. But in 1922 Ireland and beyond, it was the perception, not the reality, that influenced public debate on the issue. Had its original author, Michael Collins, survived, he might have been able to clarify its actual meaning, but with his assassination in August 1922, no major negotiator to the Oath's creation on the Irish side was still alive, available or pro-Treaty. (The leader of the Irish delegation, Arthur Griffith, had also died in August 1922). The Oath became a key issue in the resulting Irish Civil War that divided the pro- and anti-treaty sides in 1922–23. The compromises contained in the agreement caused the civil war in the 26 counties in June 1922 – April 1923, in which the pro-Treaty Provisional Government defeated the anti-Treaty Republican forces. The latter were led, nominally, by Éamon de Valera, who had resigned as President of the Republic on the treaty's ratification. His resignation outraged some of his own supporters, notably Seán T. O'Kelly, the main Sinn Féin organizer. On resigning, he then sought re-election but was defeated two days later on a vote of 60–58. The pro-Treaty Arthur Griffith followed as President of the Irish Republic. Michael Collins was chosen at a meeting of the members elected to sit in the House of Commons of Southern Ireland (a body set up under the Government of Ireland Act 1920) to become Chairman of the Provisional Government of the Irish Free State in accordance with the Treaty. The general election in June gave overwhelming support for the pro-Treaty parties. W. T. Cosgrave's Crown-appointed Provisional Government effectively subsumed Griffith's republican administration with the death of both Collins and Griffith in August 1922. Prior to the passage of the Statute of Westminster, the UK government continued to have a role in Irish governance. Officially the representative of the King, the Governor-General also received instructions from the British Government on his use of the Royal Assent, namely a Bill passed by the Dáil and Seanad could be Granted Assent (signed into law), Withheld (not signed, pending later approval) or Denied (vetoed). The letters patent to the first Governor-General, Tim Healy, explicitly named Bills that were to be rejected if passed by the Dáil and Seanad, such as any attempt to abolish the Oath. In the event, no such Bills were ever introduced, so the issue was moot. As with the other dominions, the Irish Free State had a status of association with the UK rather than being completely legally independent from it. However the meaning of 'Dominion status' changed radically during the 1920s, starting with the Chanak crisis in 1922 and quickly followed by the directly negotiated Halibut Treaty of 1923. The 1926 Imperial Conference declared the equality [including the UK] of all member states of the Commonwealth. The Conference also led to a reform of the King's title, given effect by the Royal and Parliamentary Titles Act 1927, which changed the King's royal title so that it took account of the fact that there was no longer a United Kingdom of Great Britain and Ireland. The King adopted the following style by which he would be known in all of his Empire: By the Grace of God, of Great Britain, Ireland and the British Dominions beyond the Seas King, Defender of the Faith, Emperor of India. That was the King's title in Ireland just as elsewhere in his Empire. In the conduct of external relations, the Irish Free State tried to push the boundaries of its status as a Dominion. It 'accepted' credentials from international ambassadors to Ireland, something no other dominion up to then had done. It registered the treaty with the League of Nations as an international document, over the objections of the United Kingdom, which saw it as a mere internal document between a dominion and the United Kingdom. Entitlement of citizenship of the Irish Free State was defined in the Irish Free State Constitution, but the status of that citizenship was contentious. 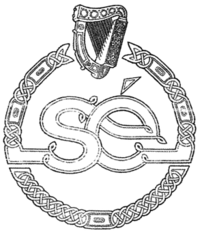 One of the first projects of the Irish Free State was the design and production of the Great Seal of Saorstát Éireann which was carried out on behalf of the Government by Hugh Kennedy. The Statute of Westminster (of 1931), embodying a decision of an Imperial Conference, enabled each dominion to enact new legislation or to change any extant legislation, without resorting to any role for the British parliament that may have enacted the original legislation in the past. This change made the dominions, including the Free State, de jure sovereign nations – fulfilling Collins' vision of having "the freedom to achieve freedom". It sought, and got, the King's acceptance to have an Irish minister, to the complete exclusion of British ministers, formally advising the King in the exercise of his powers and functions as King in the Irish Free State. Two examples of this are the signing of a treaty between the Irish Free State and the Portuguese Republic in 1931, and the act recognising the abdication of King Edward VIII in 1936 separately from the recognition by the British Parliament. When Éamon de Valera became President of the Executive Council (prime minister) in 1932 he described Cosgrave's ministers' achievements simply. Having read the files, he told his son, Vivion, "they were magnificent, son". The Statute of Westminster allowed de Valera, on becoming President of the Executive Council (February 1932), to go even further. With no ensuing restrictions on his policies, he abolished the Oath of Allegiance (which Cosgrave intended to do had he won the 1932 general election), the Senate, university representation in the Dáil, and appeals to the Privy Council. One major policy error occurred in 1936 when he attempted to use the abdication of King Edward VIII to abolish the crown and governor-general in the Free State with the "Constitution (Amendment No. 27 Act)". He was advised by senior law officers and other constitutional experts that, as the crown and governor-generalship existed separately from the constitution in a vast number of acts, charters, orders-in-council, and letters patent, they both still existed. A second bill, the "Executive Powers (Consequential Provisions) Act, 1937" was quickly introduced to repeal the necessary elements. De Valera retroactively dated the second act back to December 1936. The new state continued to use sterling from its inception; there is no reference in the Treaty or in either of the enabling Acts to currency. Nonetheless and within a few years, the Dáil passed the Coinage Act, 1926 (which provided for a Saorstát [Free State] coinage) and the Currency Act, 1927 (which provided inter alia for banknotes of the Saorstát pound). The new Saorstát pound was defined by the 1927 Act to have exactly the same weight and fineness of gold as was the sovereign at the time, making the new currency pegged at 1:1 with sterling. The State circulated its new national coinage in 1928, marked Saorstát Éireann and a national series of banknotes. British coinage remained acceptable in the Free State at an equal rate. In 1937, when the Free State was superseded by Ireland (Éire), the pound became known as the "Irish pound" and the coins were marked Éire. 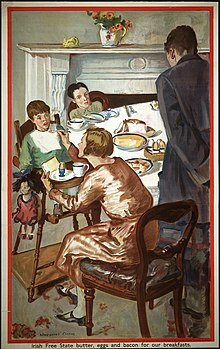 According to one report, in 1924, shortly after the Irish Free State's establishment, the new dominion had the "lowest birth-rate in the world". The report noted that amongst countries for which statistics were available (Ceylon, Chile, Japan, Spain, South Africa, Netherlands, Canada, Germany, Australia, United States, Britain, New Zealand, Finland and the Irish Free State). Ceylon had the highest birth rate at 40.8 per 1,000 while the Irish Free State had a birth rate of just 18.6 per 1,000. In 1937 the Fianna Fáil government presented a draft of an entirely new Constitution to Dáil Éireann. An amended version of the draft document was subsequently approved by the Dáil. A referendum was held on 1 July 1937, the same day as the 1937 general election, when a relatively narrow majority approved it. The new Constitution of Ireland (Bunreacht na hÉireann) repealed the 1922 Constitution, and came into effect on 29 December 1937. The state was named Ireland (Éire in the Irish language), and a new office of President of Ireland was instituted in place of the Governor-General of the Irish Free State. The new constitution claimed jurisdiction over all of Ireland while recognising that legislation would not apply in Northern Ireland (see Articles 2 and 3). Articles 2 and 3 were reworded in 1998 to remove jurisdictional claim over the entire island and to recognise that "a united Ireland shall be brought about only by peaceful means with the consent of a majority of the people, democratically expressed, in both jurisdictions in the island". The State recognises the special position of the Holy Catholic Apostolic and Roman Church as the guardian of the Faith professed by the great majority of the citizens. The State also recognises the Church of Ireland, the Presbyterian Church in Ireland, the Methodist Church in Ireland, the Religious Society of Friends in Ireland, as well as the Jewish Congregations and the other religious denominations existing in Ireland at the date of the coming into operation of this Constitution. Following a referendum, this section was deleted in 1973. It was left to the initiative of de Valera's successors in government to achieve the country's formal transformation into a republic. A small but significant minority of Irish people, usually attached to parties like Sinn Féin and the smaller Republican Sinn Féin, denied the right of the twenty-six county state to use the name Ireland and continued to refer to the state as the Free State. With Sinn Féin's entry into Dáil Éireann and the Northern Ireland Executive at the close of the 20th century, the number of those who refuse to accept the legitimacy of the state, which was already in a minority, declined further. After the setting up of the Free State in 1923, some Protestants left southern Ireland and unionism there largely came to an end. ^ Officially adopted in July 1926. O'Day, Alan (1987). Alan O'Day (ed.). Reactions to Irish nationalism. Continuum International Publishing Group. p. 17. ISBN 978-0-907628-85-9. Archived from the original on 14 April 2016. Retrieved 28 April 2011. ^ Ferriter, Diarmuid (2004). The Transformation of Ireland, 1900-2000. Profile. p. 183. ISBN 1-86197-307-1. Retrieved 19 March 2019. ^ a b "The Boundary Question: Debate Resumed, Dáil Éireann, 20 June 1924". Oireachteas.ie. Archived from the original on 1 October 2015. Retrieved 30 September 2015. Article 12 of the Treaty reads: 'If before the expiration of the said month an address is presented to his Majesty by both Houses of the Parliament of Northern Ireland to that effect, the powers of the Parliament and Government of the Irish Free State shall no longer extend to Northern Ireland.' By implication that is a declaration that it did extend, but after the exercise of its option this power was no longer extended. ^ Morgan, Austen (2000). The Belfast Agreement: A Practical Legal Analysis (PDF). The Belfast Press. pp. 66, 68. Archived from the original (PDF) on 26 September 2015. Retrieved 10 February 2019. ^ Gibbons, Ivan (2015). The British Labour Party and the Establishment of the Irish Free State, 1918–1924. Palgrave Macmillan. p. 107. ISBN 1137444088. Archived from the original on 29 January 2017. Retrieved 23 September 2015. ^ Dunning, Alastair (1 October 2006). "The Stormont Papers – View Volumes". stormontpapers.ahds.ac.uk. Archived from the original on 19 March 2009. Retrieved 16 January 2008. ^ "The Times & The Sunday Times". Archived from the original on 10 October 2017. Retrieved 10 October 2017. ^ Long after the Irish Free State had ceased to exist, when Elizabeth II ascended the Throne, the Royal Titles Act 1953 Archived 30 June 2013 at the Wayback Machine was passed, as were other Acts concerning her Style in other parts of the Empire. Until then the British monarch had only one style. The King was never simply the "King of Ireland" or the "King of the Irish Free State". ^ Except perhaps by inference: the Treaty assigned to the Irish Free State the same status in the Empire as Canada and the latter had already [1851—59] replaced the British Pound (with the Canadian Dollar). ^ "Otautau Standard and Wallace County Chronicle, Volume XVIX, Issue 971, 11 March 1924, Page 1". Archived from the original on 1 April 2012. Retrieved 21 October 2009. Coogan, Tim Pat. Éamon de Valera. ISBN 0-09-175030-X. Coogan, Tim Pat. Michael Collins. ISBN 0-09-174106-8. McCardle, Dorothy. The Irish Republic. ISBN 0-86327-712-8. Corcoran, Donal. "Public Policy in an emerging state: The Irish Free State 1922–25". Irish Journal of Public Policy. ISSN 2009-1117.